Finch feeding on thistle seed in Moore County. Charles Murphy, Extension Master Gardener℠ volunteer from Durham County interviews Byron Schermerhorn, a wildlife habitat certified consultant. Listen to this interview to learn more about habitat and shelter, food and water for birds! This is Getting Dirty in Your Garden brought to you by NC State Extension Master Gardener℠ volunteers. I’m your host, Harold Johnson, and I’m a Master Gardener in Durham County. When cold weather makes its first appearance many of us head for the store, grab some birdseed and head home to fill the bird feeder. It may come as a surprise but bird feeders play an important role in supporting native bird populations. In this edition of Getting Dirty in Your Garden we spoke with Bryan Schermerhorn of the retailer, Wild Birds Unlimited. Byron gave us some tips for keeping feeders in top condition throughout the winter so as to keep attracting birds for baths and feedings. Hello again, this is Charles Murphy, North Carolina Extension Master Gardener℠ volunteer in Durham County and I’m talking, today, with Byron Schermerhorn. Byron is a wildlife habitat certified consultant. He’s also very well versed in his extensive experience in bird feeding and bird feeding products and general care and feeding of birds. And he’s a very accomplished amateur photographer and has done numbers of pictures of birds of our local area here. So Byron, I want to take a moment to thank you for coming by. We appreciate it. And let’s start out talking about habitat. Local construction here in the Durham area just recently has destroyed an enormous amount of natural habitat. Is there anything that we can do around our houses and backyards to help restore some of that habitat that birds might need? Well, the biggest things that people will do is they’ll stop feeding the birds at certain times of the year because they figure they’re going to have enough food. Well, just as you’ve mentioned, so much of the habitat in our area has been put into construction, houses, so these birds are losing an area for shelter, water, food. We need to support them if we want to continue to have the wonderful birds that we have in our area. Then are there specific things that a homeowner could do? Suppose someone wants to make a better habitat in their yard? There are a lot of things you can do. You can start by putting different types of plants in your yards that bear fruit such as the berries, pine trees with a lot of pinecones but nuts. Not only do the squirrels eat the pine cones, but the birds will eat the seed. So we need to continue to have that type of habitat for the birds. There are times when the insects are not around. There are a few birds that do nothing but seeds only, but the majority of the birds eat insects, so during the winter time a lot of your insects are not around and so their food supply has changed drastically. So we can help them by keeping food in feeders within our yards. Not only food, but we need water plus shelter for the birds, not only in certain times of the year, but it’s very obvious that year round care of the birds needs to be done because we are taking out so much of their natural habitat. Well, you mentioned shelter, for example, let me ask you a question. I have a sort of shrub fence along one side of my backyard. I’ve allowed it to grow up, and I think that maybe I should trim it way back, but I don’t know. Does that provide good shelter for some birds? It sure does. Birds love to get into bushes like that for a couple of reasons—warmth—and when there are feeders in the yard, unfortunately you’re going to draw predators, and so they like to be able to, if they are on the feeder, they have a predator that’s coming by or getting close to them, they like to fly into the hedge and get protected, so it’s a good idea to just keep them up if you want to keep them up, so that they have a place to stay away from the predators. And the weather—because the weather is a big thing, too. We are about to have our first winter blast! We are in early December and we are about to get zapped here, I think. I have a bluebird that has been occupied for many years, but of course bluebirds aren’t nesting now. Nobody’s really nesting at this point. Should I leave it up? Would that be helpful? It’s a good idea to keep them up. Not all of our birds use boxes. Bluebirds are one that definitely uses a box and they use that box year round. And there are people that come in and say, “Well, I think I need to take my bluebird box down because they’re not nesting.” I try to convince them that we need the box up at all times. It needs to be clean and ready to go for them because they will build a small nest in the winter time to get in and out of the weather. They are very smart. They know when weather is bad and they’ll try to find a place for shelter. You’ll find a lot of bluebird boxes and you open them up and there’s a small nest of pine straw and that’s what they’ve done. They are getting themselves ready for the winter. I didn’t know that; I knew the house would be occupied sometimes, but I had no idea they would actually build in it and hadn’t actually looked into it to see if there is anything in there or not. Well, suppose we are feeding in the backyard, is there anything specific that we need to think of in terms of nutrition for birds with the weather coming on? Do we need to change our feeding patterns or…? We need to give them a food that is very high in protein. Suet is a very good source of food for them during the winter time. It is very high in fat content. Birds are like us, when we get cold, we shiver; they shiver, so at night, they get cold, they shiver and they lose a lot of their weight during the night, so one of the first things they do in the morning is to go to the breakfast table. They’re going to eat, because they’ve got to get that energy back up. We need a food source that’s very high in protein. There are some insects during the winter time that birds know how to get and find. The brown headed nut hatcher is one that will find insects underneath the bark on the tree year round. And not only is he finding insects, but he is finding some of the seeds that he has put in those little crevices on the bark year round. Do you mean he stores the seeds? A lot of birds do that. They’ll put the seed into an area where they’ll go back later on and know that there’s food there so if a feeder is empty, and then they know where a food source is. But the problem is, too, that some animals will watch them put their food up and they will go take that food, so they’re not going to end up getting all the food that they’ve put up. Right or other birds, exactly. Right, they’re smart. Well, I think they really are. Suppose someone wants to make their own, say, winter mix for birds. Can people do that okay? Very easily—you want to find a food that has not been put into a bag for over a year because by that time your food has probably dried out. A very interesting fact about birds is that when they get their food, whether they find it naturally or in a feeder, they weigh that seed. They’ll pick it up and if it’s really light, they know it’s dry, so they’ll throw it on the ground. But if it has some weight to it—and they are very sensitive with that—then they will eat it or they will store it for another day. Well, now that’s interesting because I’ve seen birds do that at my feeders and I thought, “Well, that’s just a bunch of picky birds!” I didn’t know whether there was some other reason. But there’s also another problem, too, when you pick your food is that you want to make sure you get a quality of food that does not have a certain type of seed waste in it where they put it in the bag just to get the weight up. There’s a lot of companies out that there do that, unfortunately, but so we have to watch what we get so that we get a good quality food for the birds if we want to continue to have them around. They are a great source of enjoyment of watching. They help our environment. I think it’s very important that we feed our birds all the time. Well, what about making my own. 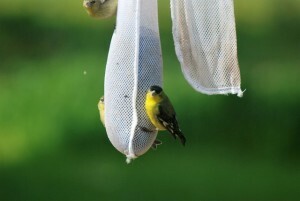 Can I make my own suet, for example? You can go to some butcher shops and get animal fat, put it together. You can find recipes on the internet for putting together your seed mixture and also your suet mixture. Another good source for birds in the winter time, even year round, is peanut butter. There’s been some stories about, “Well you shouldn’t give them peanut butter because it will gum up their mouth and they won’t be able to sing or anything like that!” But that’s false and it’s very high in energy. Peanut butter is good. You can smear peanut butter on a pinecone and hang it in a tree or on a bush, so that’s a good quality food in the winter time. If I’m looking for food to, say, seed—commercial seed—occasionally I see bags that say “For Songbirds”–sort of a generic description, but is it really good to think that one size fits all, or do I need to try to be a little bit more specific about blending or adding or making things different for different birds? Ha ha ha—hurry up, huh! Well, look, if we feed year round, are we making birds dependent and robbing them of some independence that they might have had if they had to fend on their own? That used to be a wives’ tale and I was preached very strongly that you shouldn’t do that. Well, they found over the years that that is not a true fact. They know that that food is there, but they find other sources of food supply that we don’t even think about, and they know where to find their food. You’re not going to be having them come to your feeder just to depend on that—that’s not true. Okay, so they won’t develop bad dependency habits. Well that’s good to know. We wouldn’t want that happening. Well, let’s talk about water for a few minutes. Birds and other animals as well, do get a lot of their water through the food they eat because that’s just an easy way to do it. But do they need supplemental water during the winter time or any time of the year? Is that sort of like taking a dust bath? Because I’ve seen birds do that. Exactly, that’s right. In the summertime bird will take a dust bath for the same reason, to keep their feathers in good shape, because if your feathers are in bad shape, you can end up getting sick, because those feathers are made for flying, and they have got to be in good shape so they can take off if there is a predator coming after them. Okay, so keep the birdbath full of fresh water. Try to keep it from freezing over, but if it does, try to empty it out as soon as you can and refill and just keep a close watch over it. Well that’s good to know. There are a lot of things that we can do to help birds, not just in the winter, but year round. Is there anything you can think of that we ought to keep in mind? Well, we talked about food and water and again, we briefly talked about shelter, so make sure there are areas where birds can get good shelter in the winter time. Evergreen trees are very good to have in the yard because they can go in close to the trunk of the tree and their bodies will be able to stay warmer in there because the wind is not going to be blowing in there as strong and they can stay warm in trees like that, so vegetation in your yard is a very key thing with feeding your birds. Okay, well, it’s coming up Christmas time and most of us will have a tree of some sort in the house and after a while we are going to want to take the tree out. Would it be a good idea that instead of putting it on the curb for disposal to pick up, to put it in my backyard for a few weeks and let the birds use that for some extra shelter? Yes! Definitely! Piles of brush in your yard, if you’ve got it back in the corner somewhere, is good to have because a lot of birds will use that as shelter and they will be able to, especially during the summertime, they can be able to find insects in there. And they can get a food source, plus they’ve got a shelter from predators and the weather. So if it’s at all possible, have a pile of wood. And Christmas trees are very—a lot of places will take them out to the lake and they will put them around the lake and your fish will use them as an area to start their nursery and will get into the area of the tree like the birds do on the ground. That’s interesting. I didn’t know that. Do we get many migrators in our area in the winter time? We do get a lot of people—people!—birds from up north. Migration is—I’ve been reading about migration—it’s interesting in the fact that, I thought for a long time that the reason that birds migrate is because the weather is so cold where they’re at, but basically what migration is, is the fact that they move. Their food source is their key thing. If their food source in the area where they’re at, during the winter time is gone, they will go down farther south to find an area that has a good strong food source. Not all birds migrate. We have a lot of birds, in this area, here year round. Now, they may be what they call a “local migration”. Some of the birds will go down to, say, around South Carolina, but North Carolina, South Carolina, or the western part of the state or the eastern part of the state—again, it’s geared to a matter of food source. Well, one thing I’ve noticed, not just this year, but in years past, as well, is in late fall and early winter, I start seeing a lot of robins and robins are sort of associated with spring time and it’s not spring time, and I’m just wondering if some of these are just migrants, maybe, from somewhere else? They might be some of them, but they are also here pretty much year round, too. They are basically—they love worms—that’s one of their great food source. I have never seen one on a feeder. That’s not to say they wouldn’t, but mostly they eat insects. There are birds that eat nothing but seed, and then you’ve got birds that eat seed and insects, and you have some that eat nothing but insects. One other thing, coming back to shelter for just a minute. I’ve heard, I have never seen this, but I’ve heard that in cold weather, especially, that if there’s a birdhouse up, for example, my bluebird house, that becomes a sort of communal shelter overnight sometimes, that lots of different birds—well, maybe not different species—but lots of birds will get in there and just to sort of huddle together and stay warmer. Is that so? That can happen. And of course there’s a little critter that likes to get in your box in the winter and even in the summer time. We have a little flying squirrel and he loves to get into a box. And they are very small and they can build a nest in there very quickly, and you don’t see them because they are all nocturnal—they are all out at night. Aha! Will they evict a bird? Well, I think there will be some battles between whose house is—who belongs to the house! That’s interesting! I think this has been a good sort of introduction, informational session about doing things for birds, not only in the winter, but especially in the winter because it is colder, that some of their food supplies are limited, and they deserve as much help as they can get. And as long as we are not making them dependent, then I think we all would enjoy doing things for them and it’s so much fun to watch! Definitely! As they say, we can learn a lot from the birds. And to watch them feed their family and bring their youngsters to the feeder is incredible! Well, Byron, I want to thank you, again, very much for coming. Episodes of Getting Dirty In your Garden are available as a downloadable podcast and thanks to Georgiana Kiggins, an Extension Master Gardener℠ volunteer in Lee County, a transcript of each episode is also available on the website. Until next time, why not go out and get dirty in your garden? • Want to Help Bees? Plant Flowering Herbs! • What's under (or on) your Christmas tree?